Posted: Fri Jun 18, 2010 2:47 pm Post subject: Highest end OBG - 228,000 yens model information? Does anyone here owns this rarity? 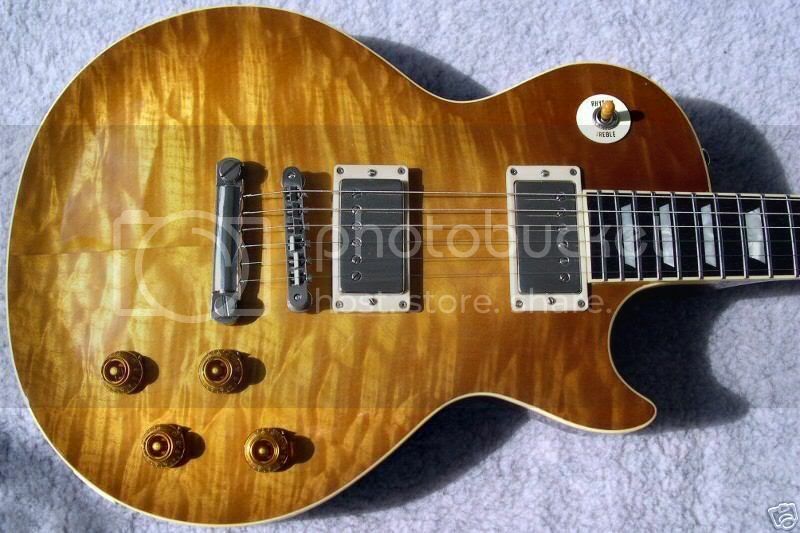 (usually you see regular 59R's) but not the mightiest Orville by Gibson of them all, - 228,000 yens LPS-QM Quilted Maple model (which was twice as expensive as regular Reissues). Or anyone with LPS-FM (198,000 yens) model? I have never seen any up for auction,mega rare guitar...I think VILLAGER has the closest thing to one? Think they are like the fabled GRECO egf-2500! I have a 1991 LPS-QM. Even have the original warranty card with it, but not the original ObG case. Not too different from Villager's, but mine is a lemon drop finish. That's her. A bit lighter in person. I can't speak to rarity, but I have only seen this one, and the one which Villager has, which is in some ways quite similar. I have seen a couple of the LPS-FM for sale over the past 2-3 years, even without seeking them out. edit: Actually, I just checked, and the s/n of mine is within 50 numbers of Villager's. Different coloring in the finishes, but the quilted tops are quite alike, I think. Hmm, from what I gather OBG QM 228,000 models (and 198,000 FM) had all the features, fret edge binding, goldish Orville by Gibson logo, 57 PAF's, 50's (thick profile neck), etc...). Could you provide more specs of your guitar? You can search the forum with "LPS-QM", and there are a few threads from 3 or so years ago. To reiterate what Villager said, mine is not a reissue, it's a 1991 (or 1992 - the serial numbers confuse me). No feb. But, solid quilted top, etc. The neck isn't as "fat" as a RI, it's pretty close to a 1960 LP. 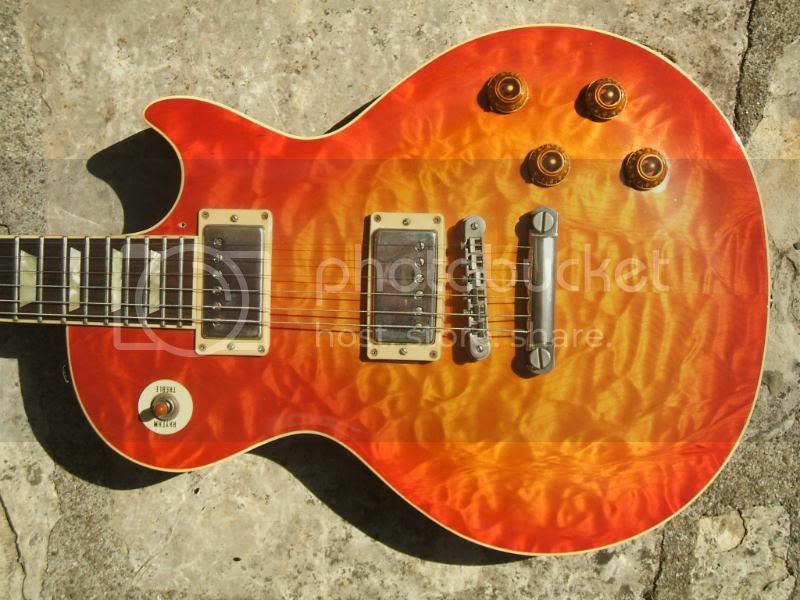 (a real 1960 LP, or a R0, not the standard Gibson production) Probably a bit under 9 pounds. Like all the LPS-QM and LPS-FM, never drilled for a pickguard. Here's the info I got from japanese enthusiast who had experience with them. There were premium QM RI Models and standard QM models. The higher end models had fret edge binding, and all of the RI features - their top was entirely quilted, and guitar's sides, back and neck were suppose to have the same color(whatever the top was). They were very heavy and super resonant, had 57 PAF's (neck had 57 and bridge had 57 Plus), made in limited quantities. I'm trying to get a picture of it, If I do so I'll post it on the forums. i dont think thats right, 57 classic plus did not exist in 1995 did it?, and I have never ever seen a solid quilt with fret binding, fret binding was only 93/94 and I am pretty sure the quilt tops stopped in 92/93, heh but i could be wrong!! Yes, from the OBG catalogs (on Japanaxe) they were before the reissues and they were top of the line which anyone can tell just by looking at them. Absolutely gorgeous even when I am really not a quilted lover ! Thank you. She is not only quite lovely, but very good sounding as well. Gibson claims to have introduced them in 1992. It does make sense, as that was the year they got really serious about doing proper reissues. fair enough, but I still don't think there are any quilttop obg with fret binding..
only a myth at this point until proven otherwise.